We think you'll agree these artisan-baked crackers go well with almost everything. 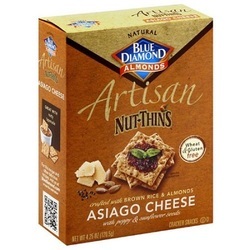 Now you can enjoy the delicious taste of Blue Diamond Artisan Nut-Thins with the added tasty benefits of ASIAGO CHEESE with poppy and sunflower seeds. We're sure they'll be your new favorite, guilt-free snack!